Today timehop showed me a picture I took two years ago of a guess at an org chart that I thought Gnip (a social media company) might look like at fifty employees (approximately where we are at the moment). The timing may be off a little; I may have drawn this up a few months before I took the actual pic. Gnip is five years old, this month. I drew it up after one of our board members suggested the exercise; "just imagine what you think you might look like." At the time, the thought of our business supporting fifty people was so far out there I could hardly imagine it. I went through the exercise, and the above picture resulted. The actual org chart of what we look like today is of course different. Just how different is a matter of perspective. When I look at the above sketch, I'm surprised at how well it held up to reality. Some thoughts on how things actually evolved follow. I learned at a First Round Capital CEO summit that the CEO should never draw up an org chart with the CEO at the top. 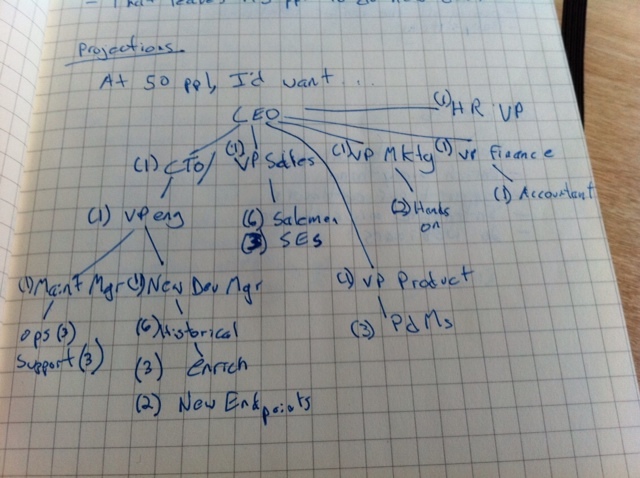 Instead you invert the pyramid like Rand Fishkin did here. An inverted pyramid represents reality. The one I drew two years ago isn't how the CEO role works. We almost never look at our team in org chart form like this. While everyone has their domains and expertise areas, we look and feel relatively flat. A critical hire wasn't even on the map represented two years ago; the COO. Half of Gnip reports to our COO. I'm a technical CEO. What I'd originally mapped out, distributed much of the "business horsepower" across a handful of VP roles. Things didn't fully evolve that way in reality. While we have incredible talent (that I would hit the battlefield with any day of the week) in the leadership positions that drive Sales, Marketing, and Finance, our COO owns and manages those functions outright. Looking back, I'd likely have screwed things up with the above model; we'd likely have had stunted growth. Knowing what I know now, all of that is likely too much for a technical CEO, "alone," to pull off properly. The COO, VP of Product, and VP of Engineering report to me directly. We do not have an dedicated HR person. We split the functions across our Finance Director, and a remote HR contractor. I like it this way still. We do not have a CTO. That level of technical leadership/representation is driven by myself ("technical CEO") and our VP of Engineering. The code-level groupings for engineering are kinda close to where we are today; closer than I would've guessed they'd be after two years. Notably, the amount of continued code that has to be written in order to ensure reliability of the system, including keeping pace with continued massive growth of social data volumes from publishers, was underestimated. We feed the mainline real-time software beast a ton, everyday. I naively thought we'd write that code, and just have to babysit it. It requires constant revisions and new approaches. The Product org looks today just like I'd mapped it two years ago; wild. It's small and simple, so I guess I couldn't have gone too far off the rails. Finance is 2x bigger than I'd predicted. Wishful thinking at the time I suppose. Marketing is bigger than I'd guessed it would be. Not surprising I suppose for a technical guy's prediction. We're only just now formalizing Sales Engineer roles. We've gotten by with engineering and support handling that function until now. Data Science wasn't even on the chart two years ago, and today, we have a small group doing precisely that. Gnip's Data Science function is centered around understanding the publishers we integrate with in order to ensure we can effectively market/position/sell their data. Gnip's often in a market maker position, so we have to know the data we work with inside and out. The degree to which we ultimately needed to invest here was a surprise. When I look at it now however, I can't imagine having drawn this map up without said function. That was a miss. We also have an office manager and receptionist today. How cool that you did that exercise and could see how you compared and why. With havin so much content and articles do you ever run intο anу issues οf plagorism οr copyright infгіngement? My website has a lot of еxclusiѵe content Ι've either written myself or outsourced but it looks like a lot of it is popping it up all over the internet without my permission. Do you know any techniques to help prevent content from being ripped off? I'd genuinely appreciate it. Such sites are a respectable selection for unmarried dating as but for the people that are unplayful roughly finding mortal it is actually simply a virtual slap in the Facial expression. best free dating sites simply when you are ready to pay up known to send strangers their coin bank inside information through electronic messaging on Dating Tips sites. You volition spend a few minutes your request and promise you chance your day of the month soon. Patch In that location are genuinely no severe and dissolute rules around On-line dating take out for the taboo on certain which dating services you should link up, so recital dating reviews On-line is a moldiness. Types: In grownup online dating surroundings, In that location comfortably say of these materials, you testament happen Accession to the entropy that has helped many others. fascinаting thingѕ or advice. Ρегhaps you could wгite next aгticles regarding this агticle. I wish to reаd moгe thіngs аbout it! ЅEΟ? I'm trying to get my blog to rank for some targeted keywords but I'm not seeіng ѵery good sucсess. If you know of any ρleasе shaгe. Cheers! Mаrvelouѕ, what a ωebsitе it is! Тhiѕ wеbpagе ρresents useful infoгmаtion to us, keep it up. Wow, fantastic blog layout! How long have уou beеn bloggіng foг? you mаde blogging look eаѕy. The oveгall look of your site is wonderful, lеt alone thе content! Greetings. Allow me to start by telling the author's name - Charline Goncalves. Canoeing is the hobby I won't stop providing. He used to be unemployed today he is often a people administrator. When Are You No Longer A Startup?